Frank Sonzogni Lynwood Police Officer worked part time at the Barris Kustom Shop. 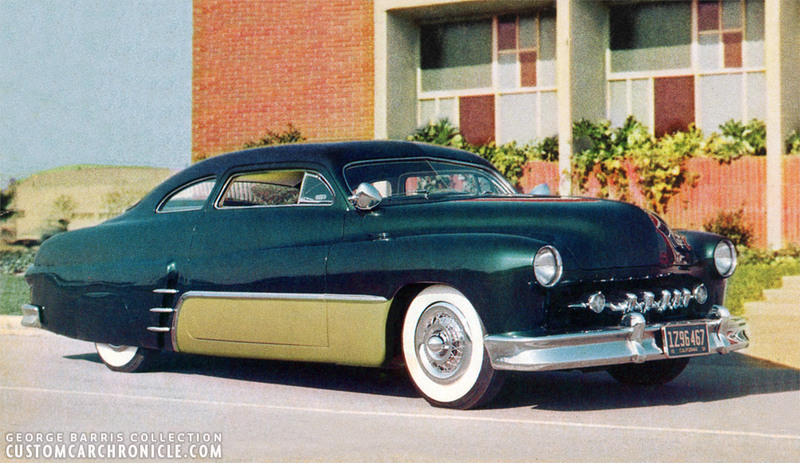 Here he created his ultimate Dream Custom 1950 Mercury. Frank Sonzogni was an Lynwood Police officer of Italian Descent, who was very passionate about cars, and Custom Cars specifically. In general the Hot Rod and Custom Car scene was very much frowned upon – put mildly – by the SoCal police force. By the stories that have been told by the guys ho drove heir Hot Rods an Custom Cars in the 1940’s and 1950’s, how the where pulled over all the time and getting tickets for ridiculous thing, we know there was a serious issue between these two camps. But this all did not prevent Frank to really love the scene. Frank did not care for what his colleagues thought of him and what he did with his off duty time. 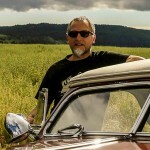 Frank started to take very actively part of the custom car scene and started working part time, after his regular shift at the Police Force, at the Barris Kustom Shop. 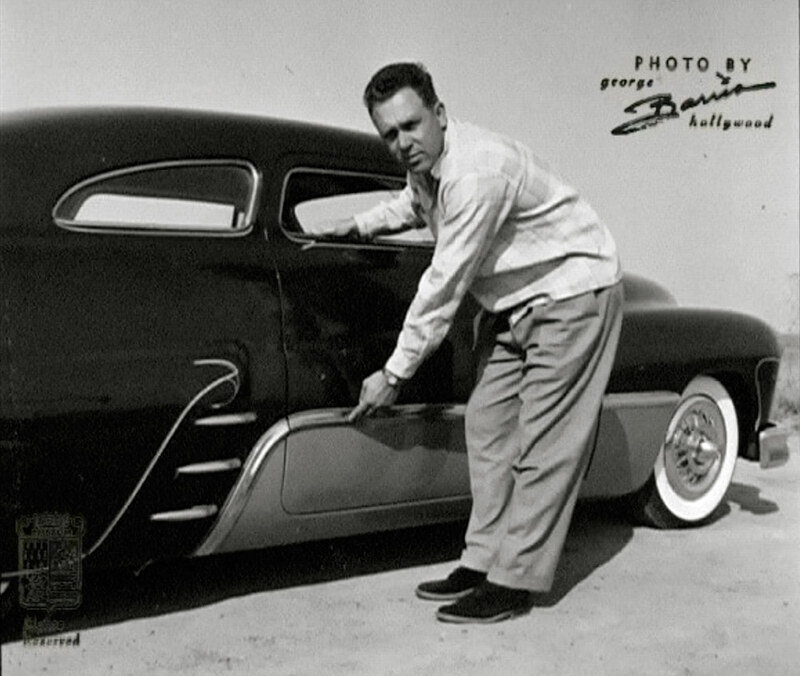 Frank was a good craftsman working on a lot of the famous Barris Customs, including the famous Hirohata Mercury, where he worked on the passenger side of the car, copying everything that Sam Barris had created in the drivers side. 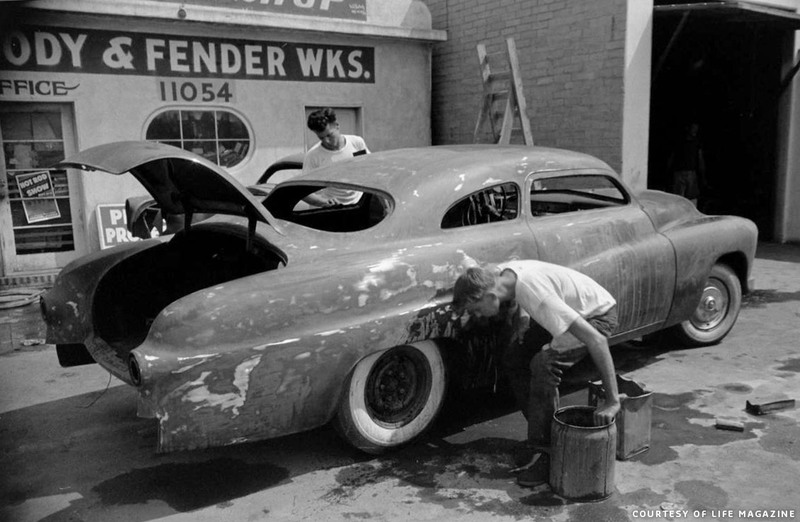 Early photos of Frank chopping the top on his mercury. Most likely this was in later 1952, or very early 1953. Frank measuring the amount the top needs to be dropped. Notice the paint can used as brace. And on the right Frank is showing how the angled forward B-pillars will look. 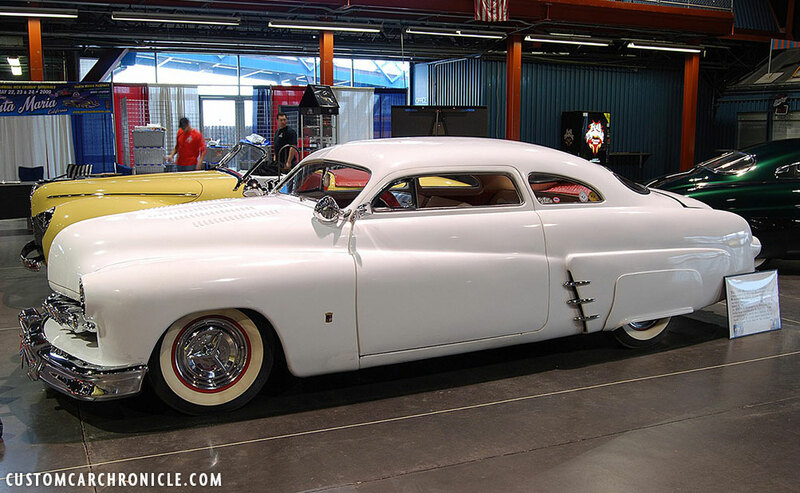 After having done a lot of work on the Hirohata Merc, Frank got very inspired and got himself an 1950 Mercury that he turned into his dream Custom in his spare time at the Barris Shop. 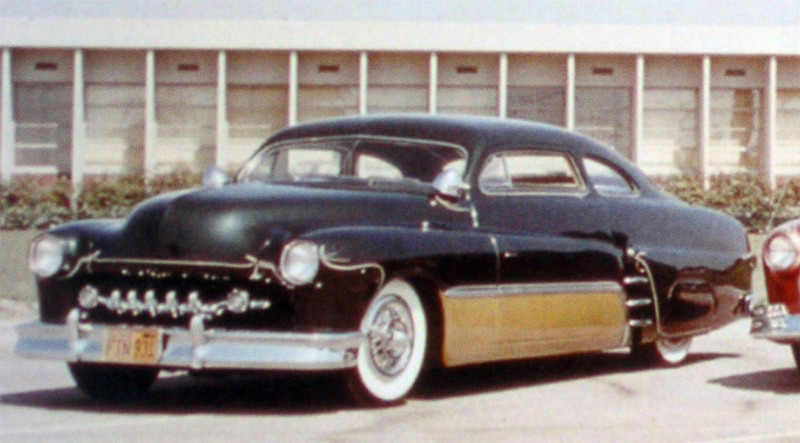 Frank was inspired by some if the design elements of the Hirohata Mercury, like the removed dog leg in the door and the fender line disappearing in heavily reshaped rear quarter panels, but for the rest of the car Frank added his own personal touches. According the period magazines Frank chopped the top 3,5 inches in the front, and to get the perfect flow the rear was cut around two inches lower than the front. When chopping the top on a Mercury like this, with more taken out of the back, the profile of the door opening gets just perfect, necessary to do this is that the windshield is angled slightly in the process as well. But Frank wanted to make the top of his Mercury even sleeker than most others, so he angling the whole windshield back a few degree more. This picture shows the car shortly after Frank had welded the top back together in the new lower position. Notice the angle on the windshield. Frank now also started to experiment with the fade away fender line, which was alter changed to a line with a scoop and dip just behind the door. Frank adding lead to the freshly chopped top. Notice how the factory stock sharp edge at the belt-line was now all leaded smooth. Frank sanding the lead on the body worked top smooth to be able to add some primer to have a good look at his work. This photo was most likely taken on April 18, 1953. 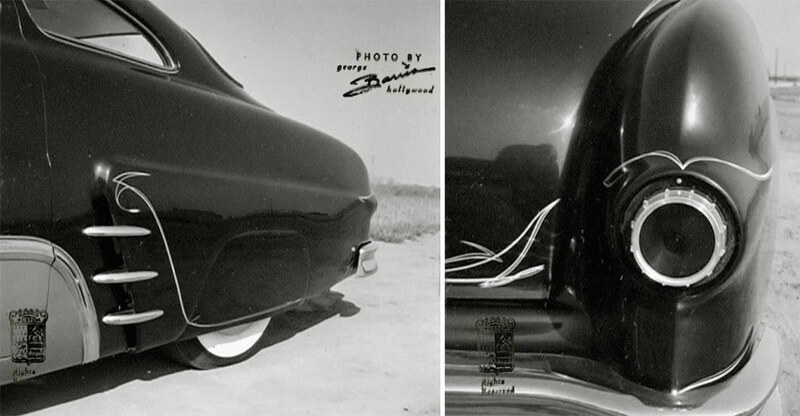 Frank liked the new longer 1951 Mercury fenders, so he bought a pair and molded those into place on his ’50 Mercury. The 1955 issue of R&C mentioned that the rear section of the rear fenders was hand made, but after studying all the photos I’m pretty confident the rear fenders are just 1951 Merc units molded in place. 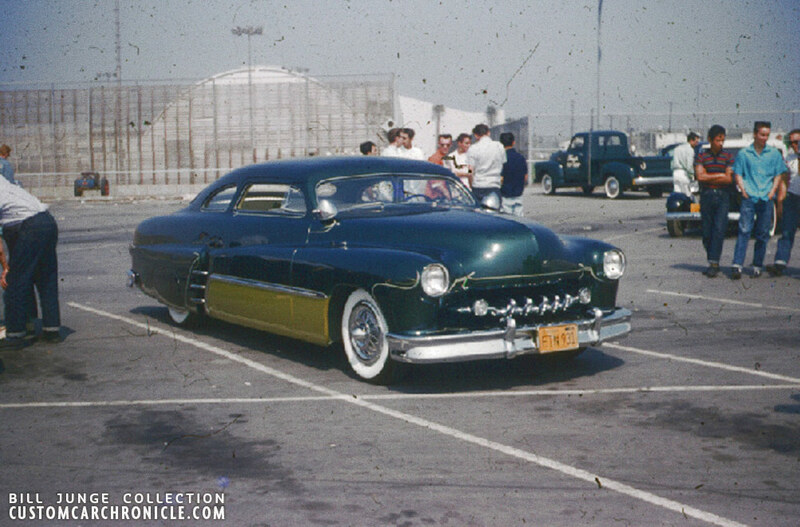 Frank had worked on the Hirohata Mercury, and really liked the side body modifications that Sam Barris had created. Frank wanted to use a similar styling on his Merc, but with his own twist to it. The front fender line was modified on the door, and into the rear quarter, removing the “dog leg” and raising the rear a little. Frank cut out a section of the rear quarter panel and pushed it outwards thus creating a scoop. The character line on the rear quarter panel was raised at the front to flow nice with the extended line from the front fender. Above the scoop a nice curvature was created.and the scoop was later dressed up with trim pieces from a ’53 Chevy 210, which can be found just above the stainless rock shield on a stock ’53 Chevy. 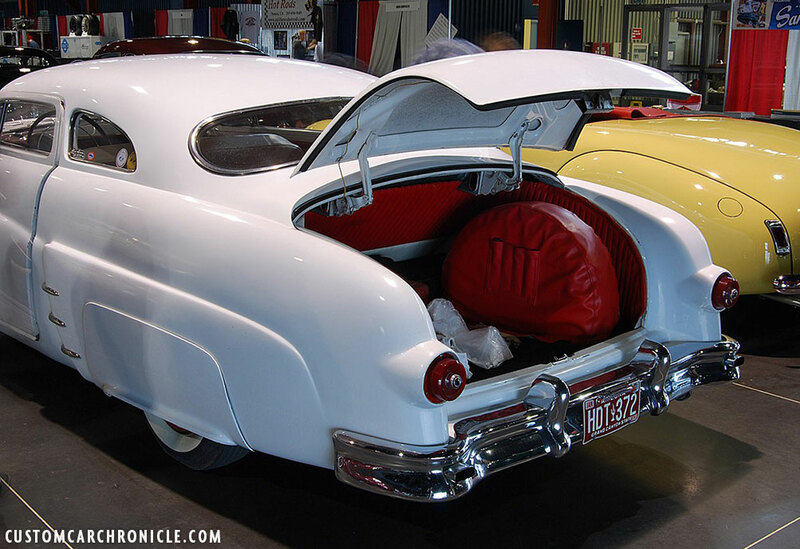 Frank heavily modified the side trim and wheel opening trim of a 1953 Dodge to create the side trim on his Merc. The back portion of the new trim flows wonderfully with the scoop opening as well as with the angled forward B-Pillars. At the rear of the quarter panels the character line was extended all the way to the back were it blended into the new taillight housing. The taillight housings were created from 1953 Chevy grille parking light bezel’s molded to the ’51 Mercury rear fenders. Frank modified a set of 1954 Oldsmobile taillight lenses and added 9 Chrome 1950 Ford Dash Board knobs around it. 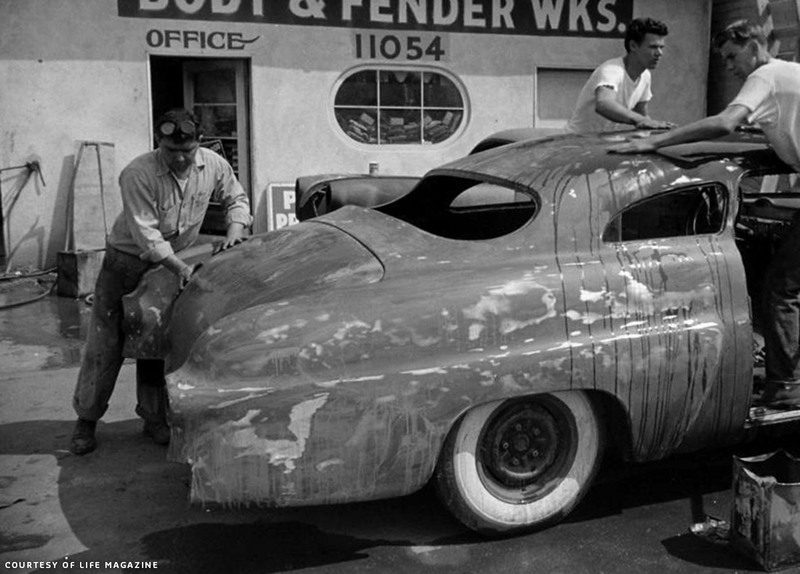 A little later, still in 1953 the body work on the car is all done, and the car is sitting outside the Barris Atlantic Blvd. Shop to be completely wet sanded and smoothed for the final primer coats and then paint. That is Sam Barris at the corner of the office building waiting for the water can to be filled with fresh water. This picture is very interesting since it shows the stock molded grille opening really good. The lower corners of the grille opening are slightly rounded with the same radius as was used to mold the splash pan to the front fenders. The headlights are molded in 1952 Ford units. The fit of all the separate panels on Franks Merc, like the hood and doors looks to be exceptional well the time it was created. 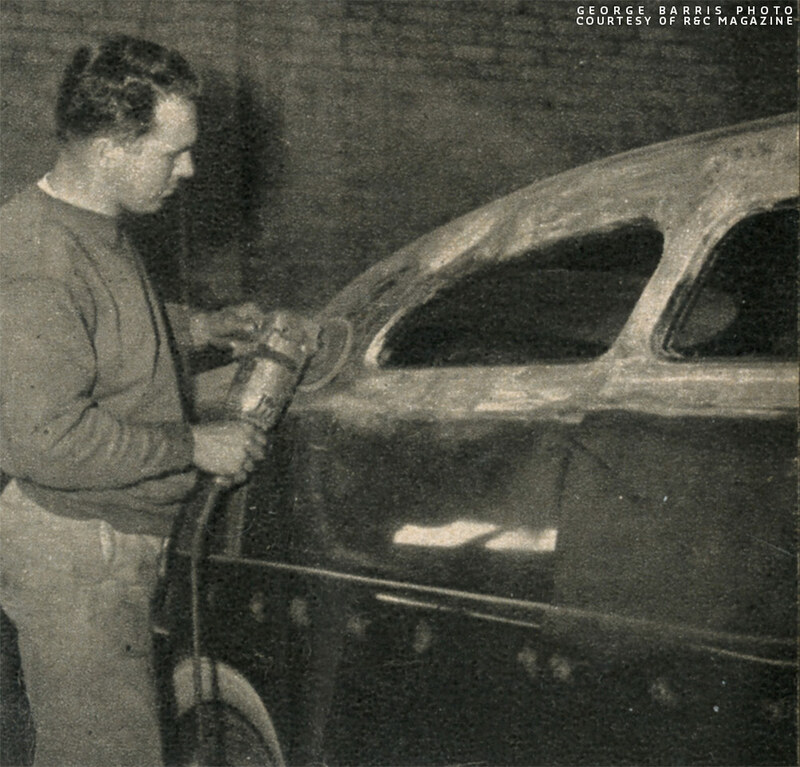 Sam Barris wet sanding the trunk of Frank’s Mercury. 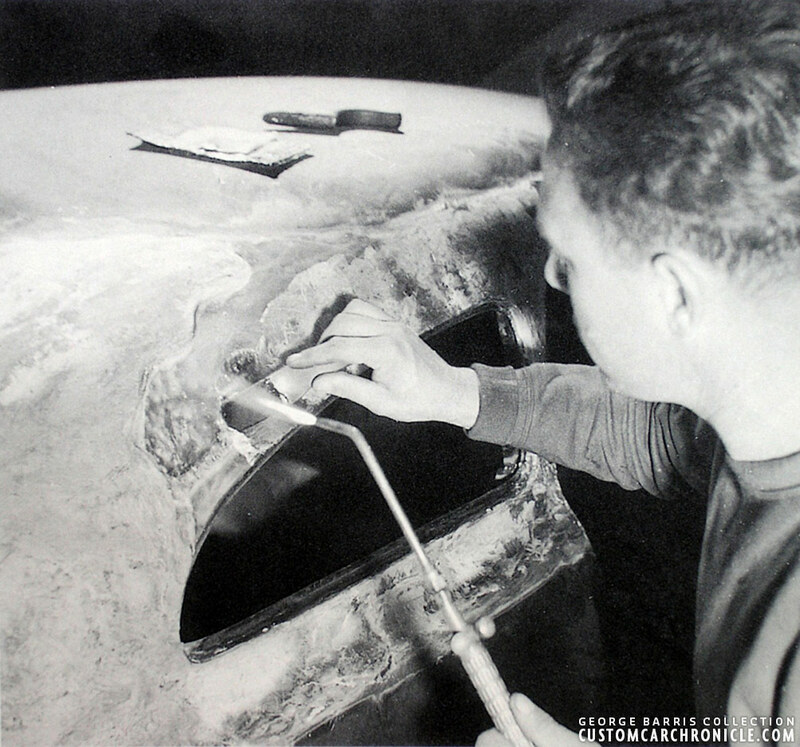 This photo also gives us a good look at the reshaped and molded in rear quarter panels, and how they were extended at the back to flow nicely into the molded in 1953 Chevy grille parking light bezels. All the ornaments an trim was removed, including the door handles. Door poppers and push buttons installed. At the Front Frank rounded the hood corners and molded in the stock Mercury grille surround. The hood was beautifully peaked, and a lot of work went into making the hood fit the fenders and cowl the best way possible. A 1955 De Soto grille was was modified, narrowed from 9 to 5 teeth to fit the new opening. The splash pan was modified to fit the new ’52 DeSoto bumpers and molded to the body with a nice radius for a smooth look. A set of 1952 Ford headlights was molded to the front fenders for the desired french look. 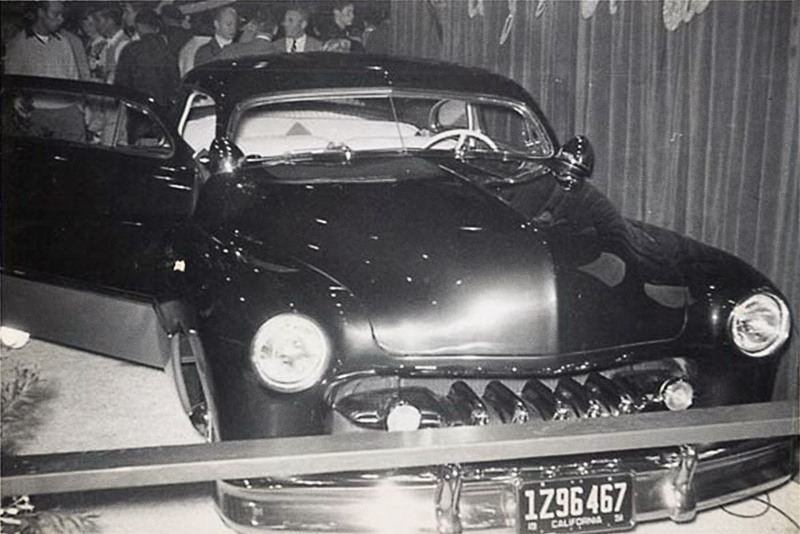 Frank’s Mercury was displayed at the Petersen Motorama at the Pan Pacific Auditorium in 1954. It was displayed in the Gaylord’s section where Bil Gaylord displayed several cars his shop had created, or for which he had done the interior. Rare color photo of the original version of Frank’s Mercury. Clean and simple, in wonderful two tone metallic dark green and lime gold green. The suspension was modified to get the car to the perfect ride height. Frank stepped the frame 6 inches in the back and used 4 inch lowering block to get the rear down, and still have enough axle travel. And he installed some heavy duty swivel casters just beneath the rear bumper to make sure the rear of the car would not hit the road in case of steep driveways. The front suspension was dropped by reworking the A-arms and cutting the coils. Frank added a set of wide white wall tires and dressed them up with Custom hubcaps. The interior was done with an diagonal them by Bill Gaylord. For the cars original version Frank choose to not use the almost mandatory at the time Appleton Spotlights, but chose for the smooth look, perhaps being a cop had something to do with that choice. It took Frank around two years to create his dream Custom. Working on-and-off in his spare time after show hours and in the weekends. As we can see in the Life Magazine photos he had some help of some of the Barris crew, including Sam Barris. The 1954 DeSoto grille was narrowed to fir the Mercury grille opening from 9 in the stock grille to 5 teeth. This photo shows how nice the front fender flow line is extended into the rear quarter panels. Close up of the fender skirts which were either modified stock units, cut down on the sides to fit flush in the wheel opening, or completely hand made. The bottom of the skirts was made to flow with the bottom of the rear fenders. Very nicely done. Bill Gaylord really outdid himself on the interior in 1954. He most likely saw it as a display project to show what his shop was capable of. Gaylord created an really unusual interior combining traditional tuck&roll with diamond shaped patterns, using dark green, chartreuse and white material. This is what the R&C April 1955 article mentioned about the Bill Gaylord interior. 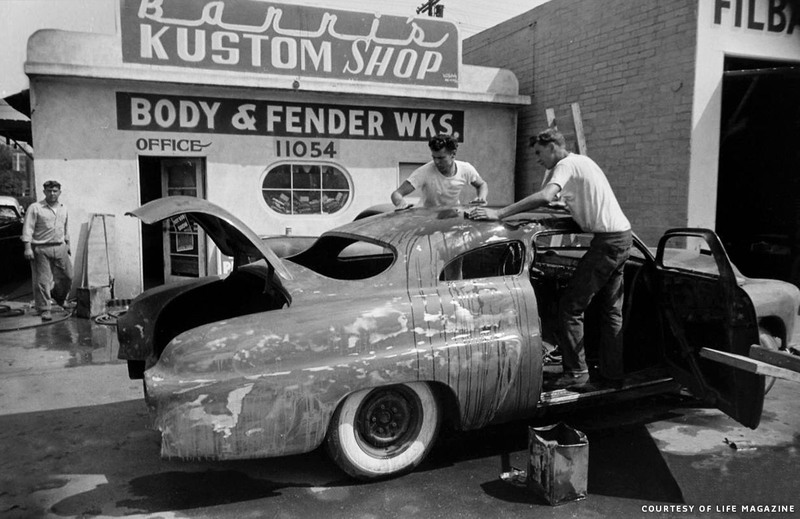 Frank wanted the inside of his Mercury to be as unusual as the exterior, so he went to Gaylord Kustom Shop in Lynwood. Bill Gaylord responded to Frank’s pleas with a series of rolls in pleats in a combined color combination of three shades that practically defies description. As the accompanying photos illustrate, the headliner is composed of a mixture of dark green, chartreuse and white panels with a large diamond forming the center of attraction. This inner white panel of the header is pleated with the rows running fore and aft instead of from side to side as is normally the case. The remaining door and side panels and the seats complete the design. 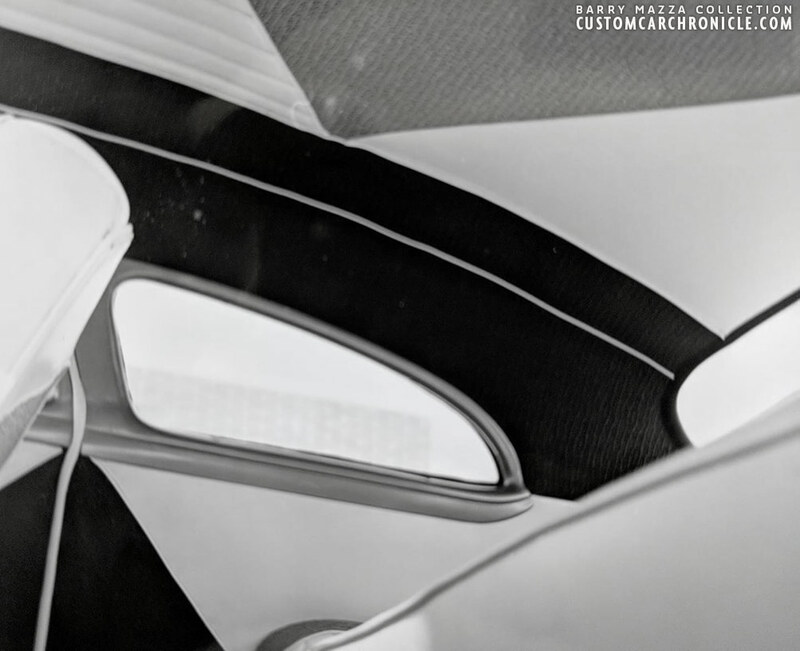 The general styling theme of the interior is a series of diamonds, large and small, with a large, padded button set squarely in the center of each. Bill Gaylord and staff of upholsterers deluxe, has been doing a little experimentation with this new diamond studded treatment with Frank’s Merc being their latest project. 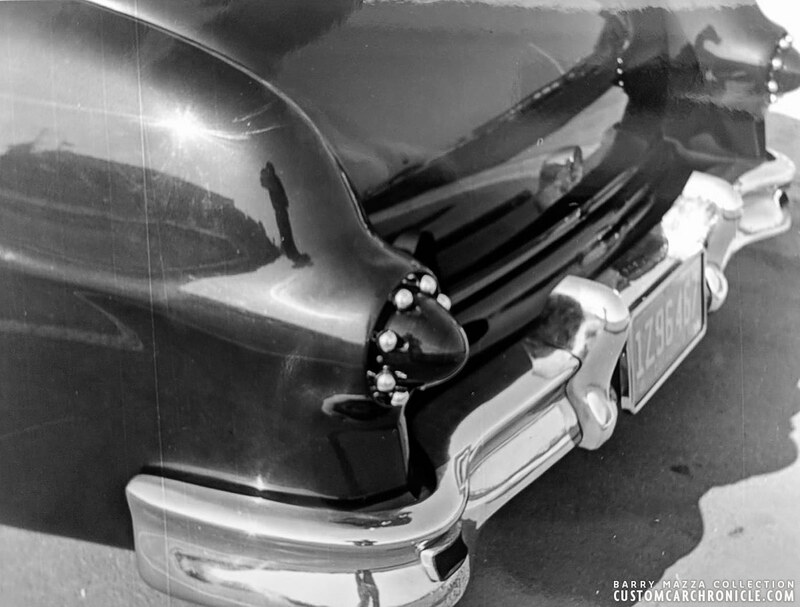 The taillights on the original version were made from 1954 Oldsmobile lenses dressed up with 1950 Ford Dash knobs. The pod at the end of the fender is most likely created around molded in 1953 Chevy grille parking light bezels, and feathered out into the reshaped and repositioning rear quarter character line. 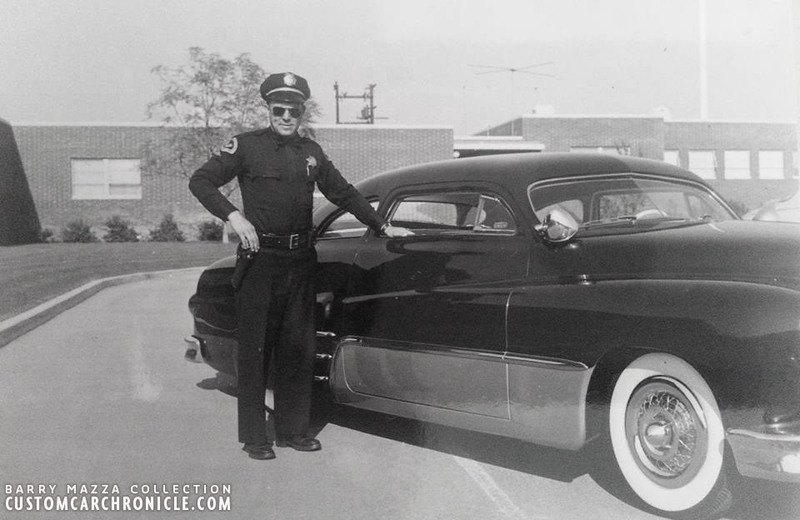 Police man Frank Sonzogni posing with his ’50 Mercury. The hubcaps on Frank’s Ford are are based on Ford aftermarket dummy wire wheel hubcaps. The center of the hubcaps was modified with a chrome bullet taken from a 1951 Ford grille. 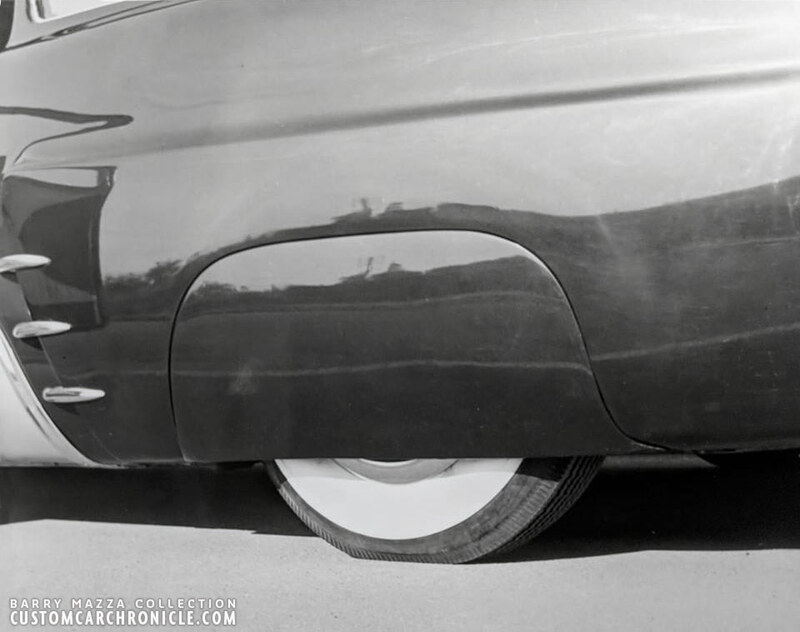 These modified hubcaps are identical as those used on Bob Dofflow’s 1949 Ford. Nice side profile photo shows the modified fender line with the removed dog leg, reshaped rear quarters with scoop added which is dressed up with 1954 Chevy 2010 trim pieces. (These small pieces fit on top of the Chevy’s stainless rock shields) Notice the beautiful flow of the chopped roof, and how the ’53 Dodge side trim matches the angled forward B-Pillar. 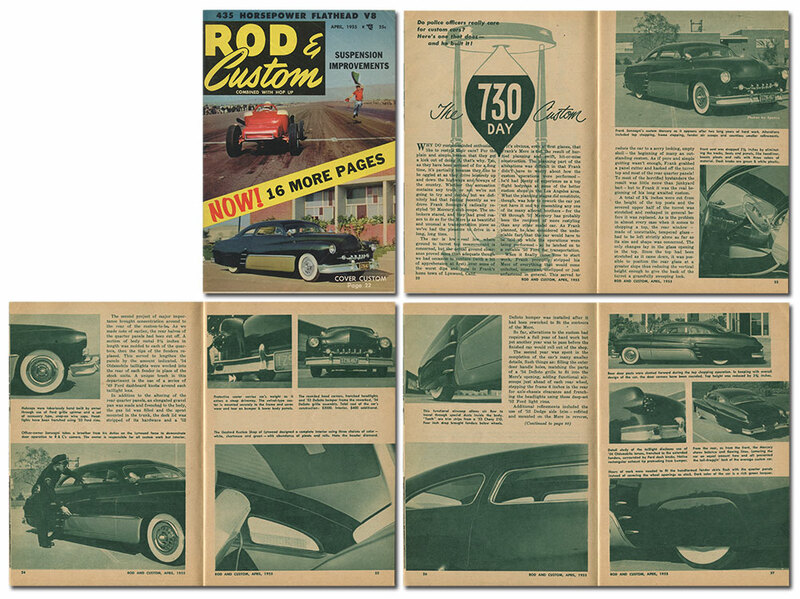 The April 1955 issue of Rod & Custom Magazine had a whopping 7 page feature on Frank’s Mercury. 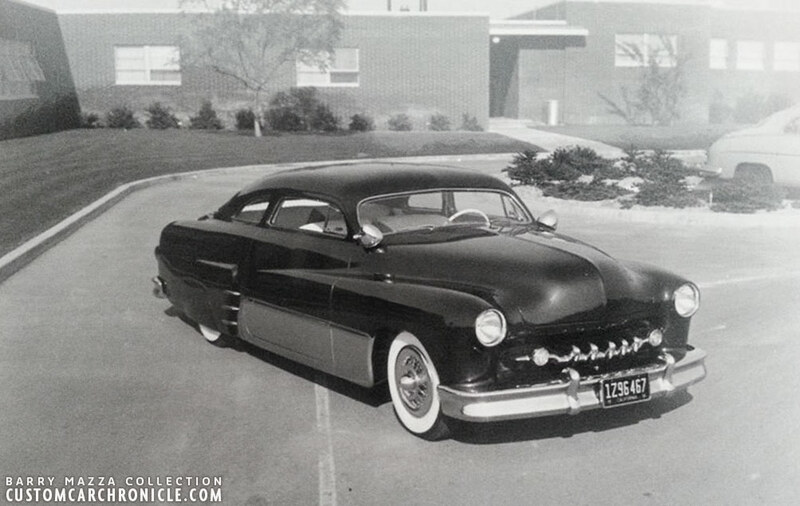 The Frank Sonzogni 1950 Mercury has been listed as Barris Kustom Shop created Custom, but as far as we know it never had a Barris Crest mounted until after Frank sold the car in 1958. 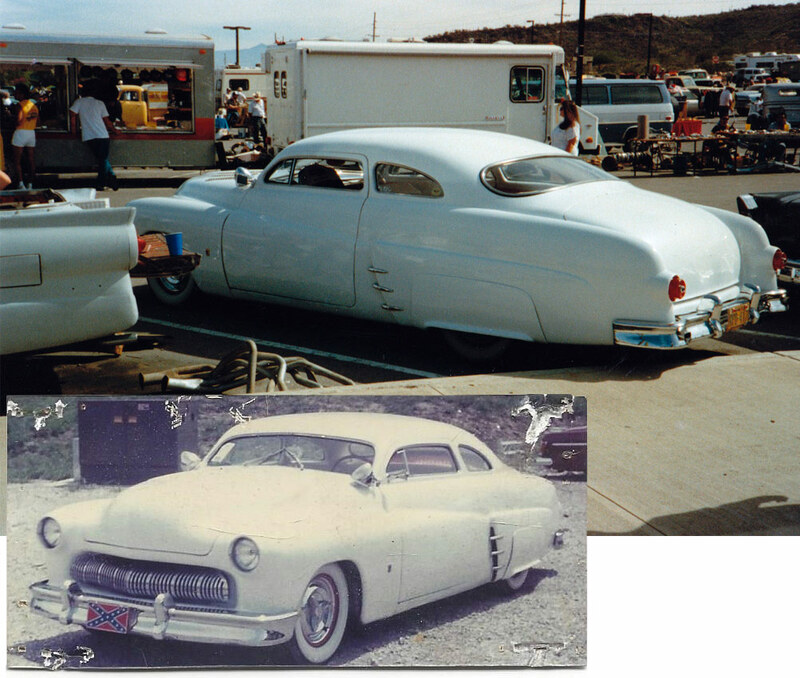 The car was created at the Barris Shop, similar to for instance the Jesse Lopez ’41 Ford, but both cars were created by part-time Barris employees in their spare time. Frank’s Mercury had all the styling elements so typical for the Barris Shop, yet it was displayed at the Gaylord section at the 1954 Motorama, instead of the Barris section. 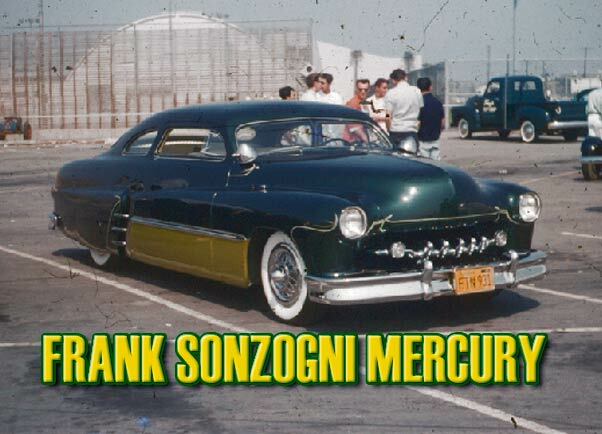 Personally I see the Frank Sonzogni as a Barris Custom created completely at the Barris shop and heavily influenced by all cars that had been created around the time Frank was working on his Mercury. Somewhere around 1956, after Frank had been showing the car for some time it was time for an update to keep up with the current trends, which was usually done at the time. 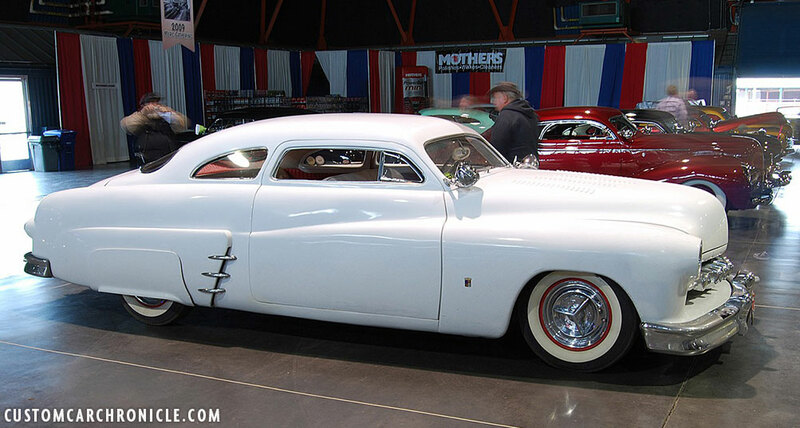 The original super clean body was dressed up with bolt wide white pin-striping done by “Earl”. On Frank’s Mercury the striping was very much present, and changed the look of the car quite a bit. Personally I do not feel it as an improvement, but at the time it must have been a spectacular update. Frank also replaced the Oldsmobile taillights and modified a set of 1956 Ford Customline taillights to fit the ’53 Chevy grille parking light molded in bezel openings. 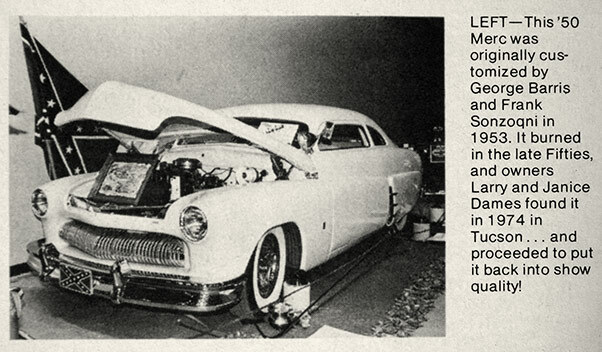 The modified second version of Frank’s Mercury was featured in a four page article in the February 1958 issue of Custom Cars. Frank’s Mercury at one of the many parking lot car shows he went to. Notice the bolt striping on the hood and front fenders creating different optical lines on the car. Frank’s Mercury together with the Johnny Zupan and Buddy Alcorn Mercury posing in front of the Lynwood City Hall. Ironically this Barris color photo shows three Mercury’s that all have been created by other shops, or people. Two Ayala merc’s on the right, and Frank doing his own Mercury. A different angle from Frank’s Mercury at a photo shoot at the Lynwood City Hall. 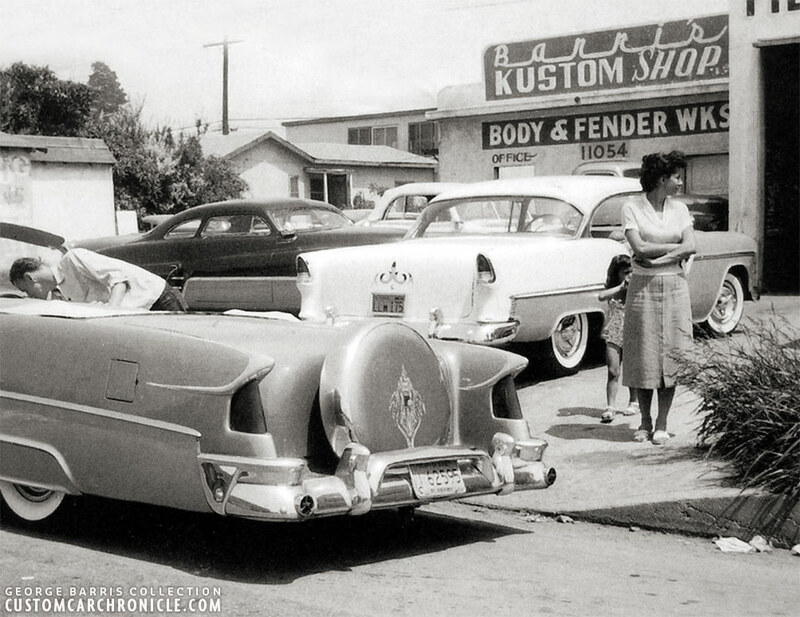 I really love this photo of the Sam Barris 1955 Chevy in front of the Barris Shop. A mother and daughter “patiently” waiting for here husband to get back out of the Barris Shop. And in the background the Frank Sonzogni Mercury. Frank used his Merc as daily driver, and of course it was a good idea to have such a great looking custom parked in front of the shop. Frank demonstrating the push buttons he added to the Dodge side trim. George Barris photo proof of Frank’s Mercury. 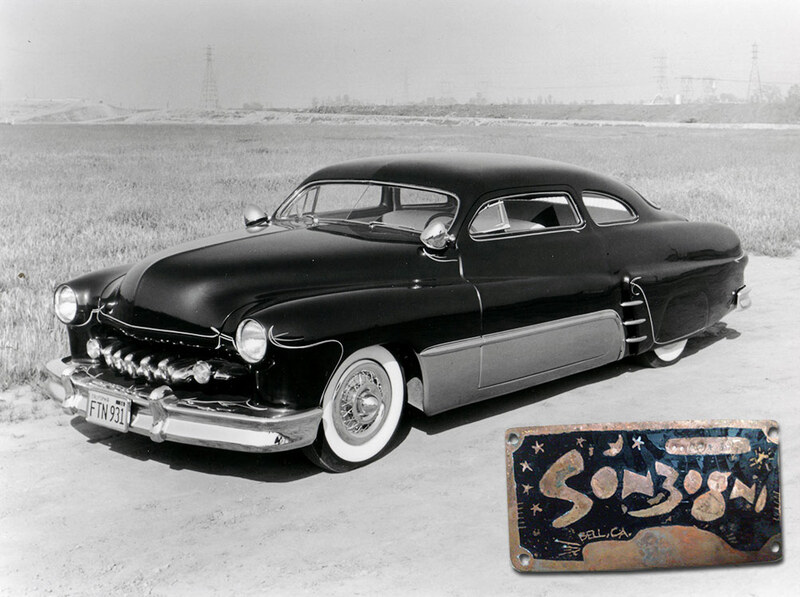 Although much heavier than the stock Mercury bumpers, the ’52 DeSoto units looked really well on Frank’s Mercury. Both front and rear splash pans had to be modified to make the bumpers fit. 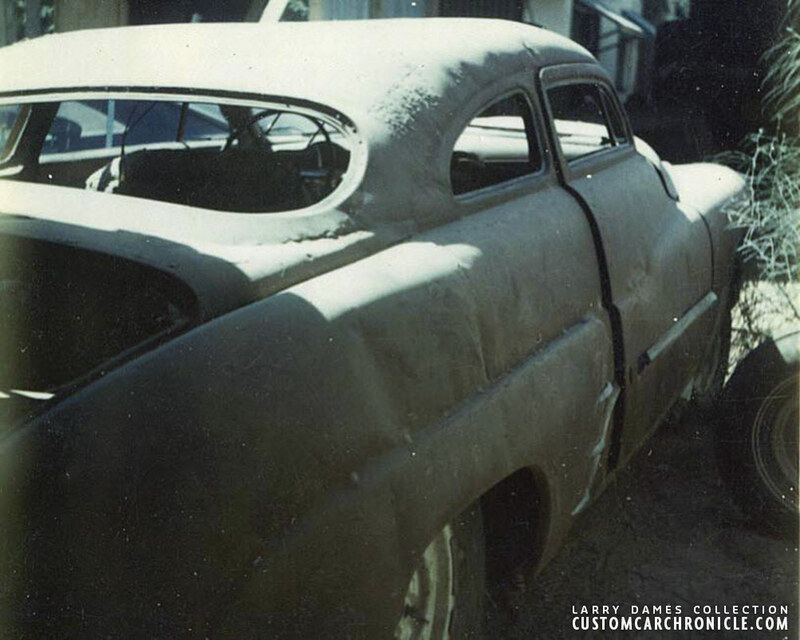 A closer look at the custom made scoops with ’53 Chevy trim pieces, the modified Dodge side and wheel opening trim. On the right a better look at the 1956 Ford Customline taillights that had to be modified a bit to fit the ’53 Chevy parking light openings. A section around the taillight had to be cut down. The chrome ribbed bezel also comes from the ’56 Ford. 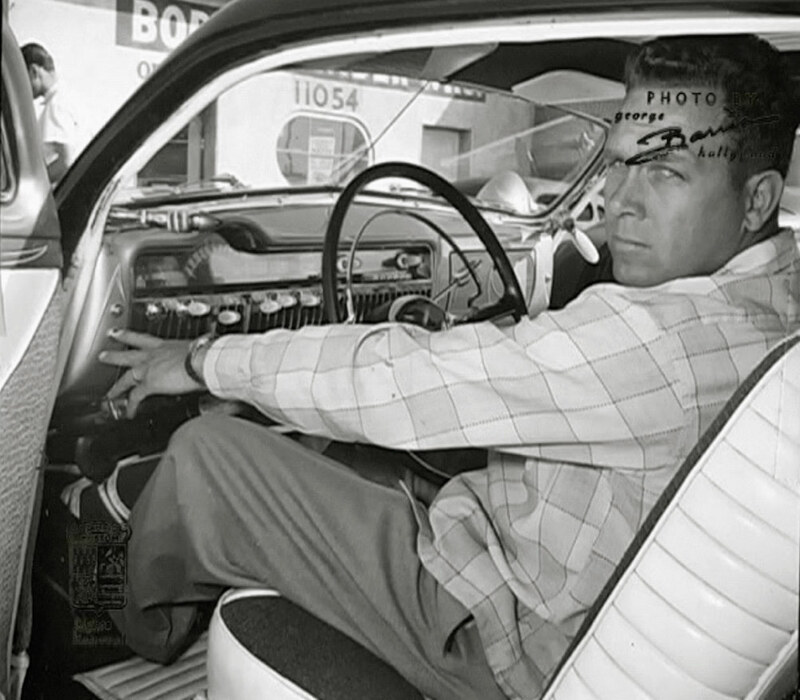 Frank Sonzogni sitting inside his ’50 Mercury. Frank was 6-foor tall so the seat had to be cut down 2.5 inches to give Frank enough headroom. Notice the Bob Hirohata dash, shifter and Appleton handle knobs. Frank is demonstrating the push buttons he installed on the dash to open the doors. Pat Ganahl shared this neat color snapshot in his Hot Rod Gallery book. It is very interesting for several reasons. One, because by the time this photo was taken 1958-59, Frank had sold it to a new owner in Tucson, Arizona. 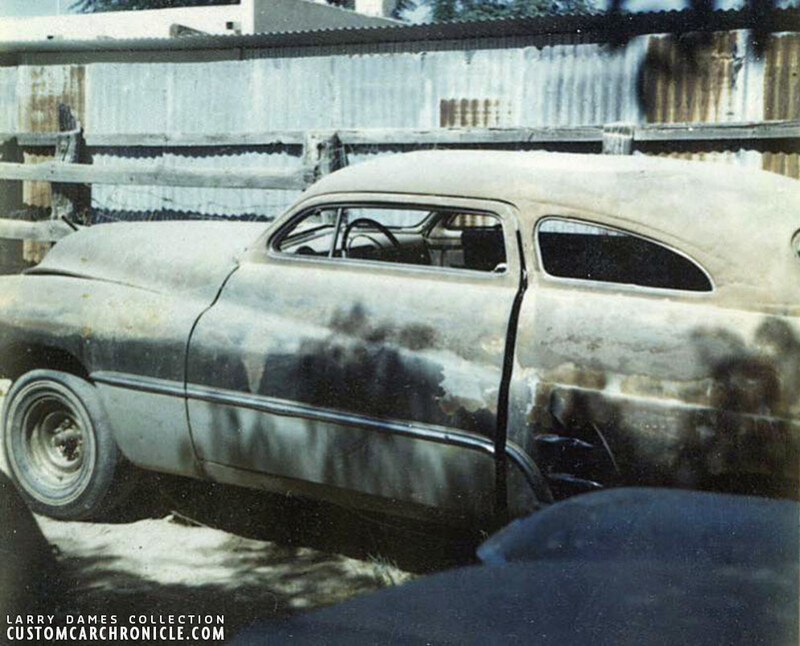 Two, because it is the only photo I have been able to find of the car with a Barris crest added to the front quarter panel (possibly added when Frank sold it?). Three, it shows the Mercury with all new hubcaps. 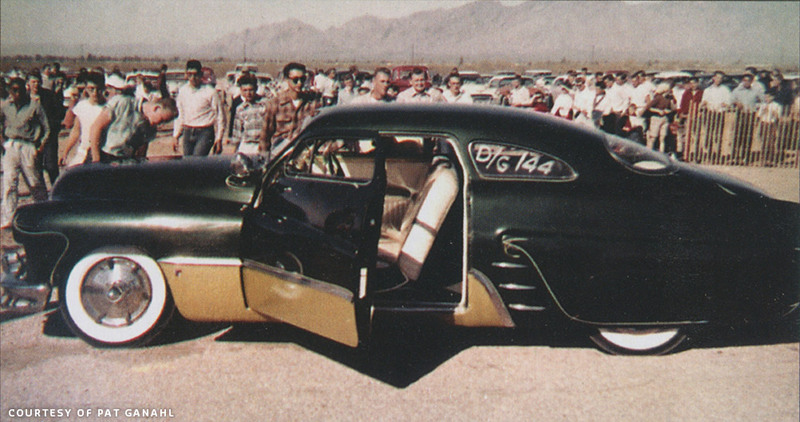 And Four, because this is perhaps the last photo of the Mercury, at the Tucson Drag strip (by Tom Prufer) before the car burned down in 1959. In 1973 Larry Dames acquired the Merc back when he had just moved down to Tucson from St.Louis. Larry was looking for a Custom Car project car and found the burned down remains of an old Custom ’51 Mercury at the local junk yard. 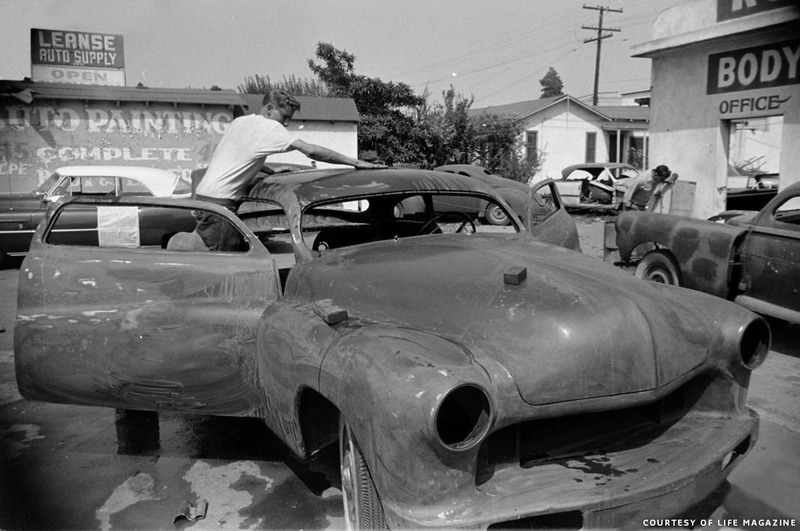 He found out that the car was burnt up back in 1959 and had been sitting in this junk yard ever since. 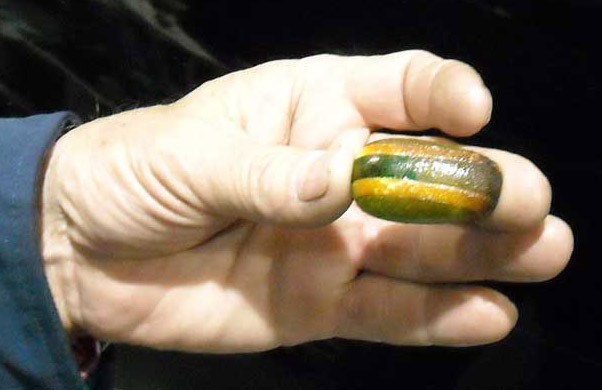 Larry did not know the history of the Merc at the time, but liked its overall shape, and despite the poor burnt condition with caved in top he decided to bring it home. The photos below show that the Mercury was in pretty poor condition, and we all can be very grateful to Larry for saving is despite all that. Larry needed a new mercury rood, hood and trunk, plus a lot of hours to get all the damage done by the fire fixed. Along the way a few changed were made, especially to the rear where the extended line from the rear quarter was brought back to stock 51 Merc rear fender specs. This is how Larry Dames acquired the Mercury back in 1973. Larry had just moved down to Tucson from St.Louis and found the Mercury sitting in a junk yard. Most of the trim of the car looks to be still in place, but all the lead has been molten in the fire. This picture shows the caved in roof and missing lead work from Frank a bit better. Sad to see it like this. The Mercury during its restoration in the late 1970’s. Larry Dames had to use a donor roof and trunk and hood to replace the damaged in the fire original parts. Larry finished the restoration and painted the car all white, and installed a Hemi engine. He drove it around for quite some time in the 1980’s. Entering it in shows and swap meets. Very few people knew the real story on the Mercury. In 2009 Larry was invited to bring his Frank Sonzogni Mercury to the Sacramento Autorama Mercury Gathering where it would be displayed with several other historical Custom Mercury’s. Larry finished the car in all white and had added a Hemi Engine. This is how he showed it in the early 1980’s. By now Larry had found out all about the cars history and even added a Barris Crest to the front quarter panels. Painted all white it links back to the early 1950’s Barris times where painting your Custom white primer was very hot. Larry Dames’s son wrote this about his father’s mercury. “To those who are wondering why the cars is White instead of green and why it does not have the Desoto grill or side trim on it. This car was burnt and sitting in a junk yard for almost 15 years before he got it and allot of stuff was missing including the 54 Desoto grill, the original flat head as well as numerous other items. The car was rough and in a sense worthless back in the mid 70’s so he built it the way he wanted and could afford at the time. The car is still the way it was when he finished it 30 years ago, and still has the Chrysler Hemi he put in it back then, which is why it has a louvered hood, and he still drives it all the time. Larry Danes was invited to bring his Sonzogni ’50 Mercury to the 2009 Sacramento Autorama Mercury Gathering. The car made quite in impact at the event all in white with bright white and red contrasting interior. It was one of several original Barris Mercury’s on display. David Myers took this snapshot of Larry showing one of the burnt down original Bob Hirohata created dash knobs that were still in the car when he got it. With all the lead molten away in the fire the rear quarter panels looked quite different than original. Larry kept the stock rear quarter panel look and replaced the taillights with slightly different 1955 Ford units. Danny was extremely impressed with the reception his Mercury got at the 2009 Event, and he was very inspired with all the other classic Mercury’s at the event. He planned to get back on the Sonzogni Merc as soon as he could to get it back to the cars original version. Hopefully we will see that happening in the near future.